I was already a fan of oolong teas when we launched Tea Time last June. Since then, I’ve developed an even greater appreciation for this flavorful medium between black and green teas. 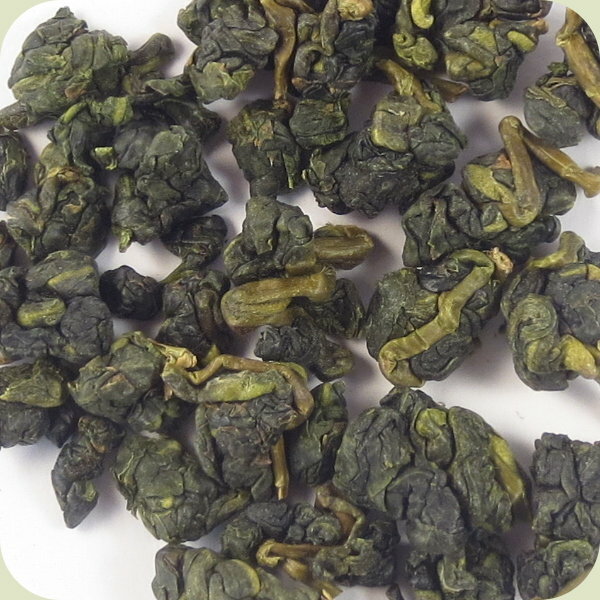 Today we have another oolong for you, courtesy of Tea From Taiwan. Wu Ling Oolong (also known as Wu-Long) is grown and harvested in the mountains of Taiwan’s Taichung county. What’s fascinating about this particular tea is that, according to Tea From Taiwan, it was grown on land that was once home to a fruit orchard. And as you’ll find out, those soil conditions have contributed to Wu Ling’s light, distinctly flavored brews. Tea From Taiwan’s Description: “Wu Ling oolong tea (wu-long tea) is our best tea in our regular collection. Wu Ling is a mountain area in Taichung County, and its high altitude (more than 1800 meters) contributes to the ideal growing conditions for wu-long tea. Steeping Instructions: Use 1 teaspoon per 8 oz of water. Heat water to just below boiling (195 degrees Fahrenheit / 90 degrees Celsius) and steep for 30 seconds to 1 minute. Add 30 seconds for each subsequent brew. Appearance-wise, Wu Ling Oolong has that typical oolong look: dark green leaves rolled into misshapen pellets of varying sizes, with streaks of black and lighter green. And like the Hua Gang Oolong we reviewed in January, it carries a faint scent compared to other oolongs. I detect grass and orchid if I breathe in deeply enough. I’m not overly concerned, though. Hua Gang behaved the same way in its dry form, and it completely won me over once brewed. Let’s see if Wu Ling has a similar trick up its, er, sleeve. Using the instructions listed above, I steep my first cup of Wu Ling Oolong for about 1 minute. (I was shooting for 30 seconds but forgot to set my timer – oops!) Out comes a pale green infusion that’s almost lime in color, but not a bright lime. The fragrance is still a subtle mix of floral and grass. The taste is also mild, but more complex than I’d expected: orchid, a little bit of grass, and fruit. Yes, Wu Ling is a lightly fruity oolong, as Tea From Taiwan’s description suggested. There’s the fresh, crisp flavor of orchard apples in September, a pear-like sweetness, and even a hint of lemon. This gives Wu Ling an invigorating quality without overpowering the senses. Very nice! Like other oolongs, Wu Ling evolves with each brew. The liquid takes on a greenish-gold color with Steep #2 (90 seconds) and then a golden, straw yellow with Steep #3 (2 minutes). A grassy, vegetal flavor develops by then, but it doesn’t overtake the fruity nuances until Steep #4 (2 minutes 30 seconds). If I hadn’t over-brewed the first cup, the apple and pear notes would probably still be the more prominent flavors. Regardless, this last steep is pleasant in a green tea-like way; and despite the shifts in flavor, this tea is never astringent, tart, or overly sweet. One more interesting characteristic of Wu Ling Oolong is its texture. It’s smooth, but not creamy or indulgent like most oolongs are. Instead, it’s a tad thinner and reminds me of broth (without any crumbs or other bits of food floating around, of course!). I’m not sure how else to describe it… But it matches Wu Ling’s refined and refreshing personality quite well. Finally, it’s worth reiterating that Wu Ling Oolong was grown on land that was once an apple and pear orchard – and its taste is evidence of this. It’s amazing how soil conditions really do have an effect on the tea plants growing there. Tea From Taiwan’s Wu Ling Oolong is as delightful as biting into a freshly picked apple. Its light body complements its delicate and unique flavor profile of fruit, orchid, and grass. Maybe that’s why it’s one of the most refreshing new oolongs (or rather, new to me) I’ve had in a while. I do miss the floral overtones and buttery texture I’m used to with oolong teas, but Wu Ling is a wonderful change of pace and something I may have to stock up on in my personal stash. If you haven’t tried oolong tea before, this is a good starting point. You can purchase Wu Ling Oolong directly from Tea From Taiwan as part of the Chong Pei Sample Pack or in larger quantities by itself. In addition to being a tea enthusiast, Sara Letourneau is an avid reader and a writer who… well, enjoys writing! Currently she’s working on a novel, and she writes book reviews and articles on the craft of writing. She’s also a published poet with works available in various print and online publications. Visit Sara at her personal blog, Facebook, or Twitter. If you’re a tea seller and would like to have one of your products reviewed here, please visit the Contributors page for contact information. Oolong fans: Here’s something you might not have tried before. Tea From Taiwan’s Wu Ling Oolong brews up lighter and fruitier than its more floral- and vegetal-flavored siblings. Curious to know why this might be? Or what I thought of this change of pace? Then head on over to my review of Wu Ling Oolong at A Bibliophile’s Reverie! Thanks, Alex! Yes, I’ve heard of houji tea, but I haven’t tried it yet. Same goes with matcha, believe it or not… *blushes* But that’s because I don’t have the right utensils at home to make matcha correctly. That’s very kind of you to offer! May I send you a DM on Twitter about that? Go right ahead, or email via my contact page. ☺ either works!